The Sustainability Leadership Scorecard enables you to have a single, engaging indicator of performance and gaps that is easy to understand and communicate. At the best of times the multi-dimensioned thing we call sustainability can be confusing. Not least the myriad of ever increasing performance improvement tools, quality standards and reporting accreditations, which aim to help, but often leave sustainability leaders feeling overwhelmed, and our colleagues and students none the wiser. The Sustainability Leadership Scorecard enables you to have a single, engaging indicator of performance and gaps that is easy to understand and communicate. 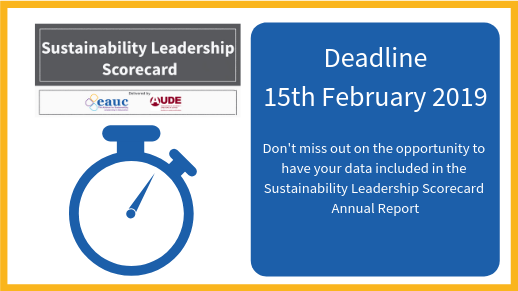 The deadline to submit your data to be included by EAUC and AUDE in the Sustainability Leadership Scorecard Annual Report is fast approaching. We are asking all institutions to submit their data to this high profile annual report on the sector’s activity and performance by 15 February 2019. We will then be collating the data as a whole to show where the sector is on sustainability and where the gaps are- our aim is to help and support the sector. Please submit your current scores for as much as you can to help us make the Annual Report as useful to the sector as possible. It can take as little as an hour to complete. After this date you can continue to use the Sustainability Leadership Scorecard as normal but your data will not be included until the next Annual Report in 2020. All data will be collated and individual institutional data will not be shared. If you require a reminder of your login or have any questions please email Fiona Goodwin on fgoodwin@eauc.org.uk.